The Ottawa Senators have had a very successful season. And I say this before the playoffs have even begun. There’s really not many teams that would consider just inching into the playoffs a success, but for a team that was expected to dwell in the Eastern Conference’s basement most of the year, the Senators have already done enough to consider this year a step in the right direction. They don’t even have to win a game in their first round match up with the Rangers. Of course, I’m sure that isn’t on the players’ minds, nor is it on the personnel, or the fans for that matter, but it is a fact. Regardless, the Sens got here. And while it’s true that even if they get swept it’ll be a good year for the upstart Senators, you can bet they’ll be pulling out all the stops to try and upset the Rangers, a team that many feel can be beaten. After all, the Senators have showed the ability to score when needed – Jason Spezza, Milan Michalek, and Erik Karlsson have been offensive revelations for the club – and they’ve gotten great goaltending when needed. Yet, they’ve still got their ace in the hole, Mika Zibanejad, fresh off a promising season in Sweden, not to mention a gold-medal winning goal at the World Junior Championships. 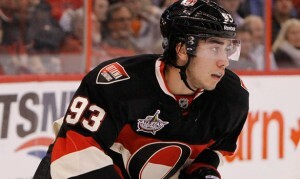 Before it gets passed over, Zibanejad has played 9 NHL games this season. If he plays another one, he’ll burn a year of his entry-level contract. If MacLean chooses to play Zibanejad, the soon-to-be 19-year-old will provide the spark and enthusiasm that could propel the Sens to a series victory over the Rangers. Take a look back at his play during pre-season where he was one of the team’s more dangerous forwards. Obviously there’s a huge (understatement) difference between the pre-season and playoffs, but there’s no question that the talent, exuberance, and excitement is there. Oh, and it goes without saying the invaluable experience the Swede will get, particularly playing with Alfie, who may or may not be around next season, though it does look as though he’ll be back. The only real case for keeping Zibanejad out of the line-up should be if there’s a player that deserves the spot ahead of him. As of now, this isn’t really a problem. In fact, MacLean tried Zibanejad on the top line in practice Tuesday, along with Spezza and Michalek, which left Foligno, Alfredsson and Turris on the second line. Better yet, Zibanejad’s insertion would mean no Colin Greening, Erik Condra, or Zack Smith near the top two lines in the series, which, for Ottawa, would be a good start. Perhaps he gets in a game or two and looks noticeably nervous or a bit shook. Then you sit him and have a talk. The point is whether or not he is the difference maker in the series, it’s that he shouldn’t sit out because of a clause in the CBA.